My column for Wine Review Online this month is about how global warming is affecting two different German regions, the Pfalz and the Mosel. 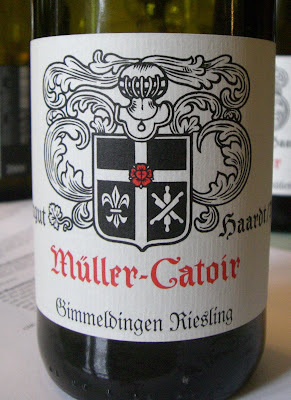 This is a column bonus, an extended interview with Martin Franzen, winemaker for the excellent Pfalz winery Müller-Catoir, which makes some of the best dry Rieslings I tried. "Dry wines were never under 60% at this estate," Franzen said. "But we sold only off-dry wines in America in the '80s and '90s. "Germany has started to produce outstanding dry wines. We have reached a level that didn't exist in the '80s and '90s. Climate change helped us. It wasn't possible to vinify dry Rieslings at this quality in the '80s. The climate was too cold and it wasn't possible to get the structure we can today." Something that's not obvious about German wine, unless you follow the writings of Terry Thiese, is how many people there are committed to terroir-driven, low-intervention winemaking. This is also a recent development. "In Germany we lost the philosophy of terroir in the '60s and '70s," Franzen said. "We didn't work in such detail in the vineyards, and we didn't pay as much attention to the good vineyards." Why? Franzen blames the bad post-World War II economy, which led to a focus on cutting costs and increasing production. This is what brought the world Blue Nun. "We have recovered the things our grandfathers knew," Franzen said. "The biggest technology changes we've made are to be able to press and work in the cellar like in the 19th century. We've changed to smaller tanks. We also reconstructed our cellar with traditional 1000-litre wooden barrels. With these barrels you don't need special temperature control." Franzen doesn't have to research in books to find out how his grandfather made wine: his family owns a tiny winery in the Mosel region. "I learned a lot from my father, who made Rieslings that were very much on the point and were not so easy to understand, but that aged very well," Franzen said. "My father had an oak press over 100 years old. He had some oak barrels and nothing else at all. He made wine with no pumping. His tradition was maceration, one day. He learned it from his father, and it makes the best Riesling. No temperature control. 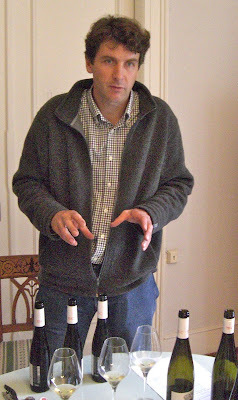 These are Rieslings that show well after four or five years." "In the Mosel region, my father made dry wines in the '70s. He made over 50% dry wines. He knew that you had to use the best grapes for the dry wines. Normally in the Mosel, the best grapes are used for the residual sugar wines. But if you want to make a dry wine in the Mosel, you have to use the best grapes. Here (in the Pfalz) it's possible to make a dry wine with other grapes. There's a little bit lower acidity." "We work here with a modern press but the philosophy and the treatment of the grapes is the same. My father didn't have modern education and he didn't know about it, but he felt it." But not everything is back to the past. Franzen has farmed organically, uncertified, for the last several years because he believes it gives him better quality. "We work more in the vineyards today. In the past we didn't make this 'green harvest'. We are outside more now. We select more." Franzen let me taste a trivia question (I hope he's right, because I don't have access to all of Robert Parker's scores). The question is: what was the first German wine to get 100 points from Parker? What I really wanted to taste was one of his father's wines: the winery name is, of course, Franzen. But his father is retired and he didn't have any on hand. "He is 78, and I didn't come home to make wine. We had to close the winery. That's the modern times." And yet, sometimes the past is modern again. One of my fondest memories of a winery visit was to this winery in 1990. As fellow winemakers we were taken into a private room and tasted the wine in fine stemware on a white table cloth. Besides drinking the best German Pinot Noir I'd ever had, we also drank a heavenly Scheurebe. I must add that I find dry Riesling to be in general less satisfying than one with a bit of residual sugar.